Arthur Carvalho is a Brazilian freelance animator and illustrator, based in São Paulo, who creates hand-drawn, collage and digital animation and illustration for businesses and bands. Inspired by the world of skateboarding and rock and roll, as a teenager Arthur found an avenue for his love of drawing, creating fanzines and t-shirts for local skate shops. Now years later, his sketchbooks are filled with bizarre creatures, geometric patterns, skateboard adventures and blocky text, which he brings into his animation videos. Arthur learned animation while working at MTV in the early ’90s, when creating hand-drawn animation was a necessity. Now working mainly digitally Arthur still prefers to create content for his animations by hand. His shaky, organic lines and collages suit the music videos of the experimental and rock musicians he likes to work with, a recent example being his black and white video for San Francisco band, Thee Oh Sees. Arthur was one of the 180 Creative Camp’s invited artists. 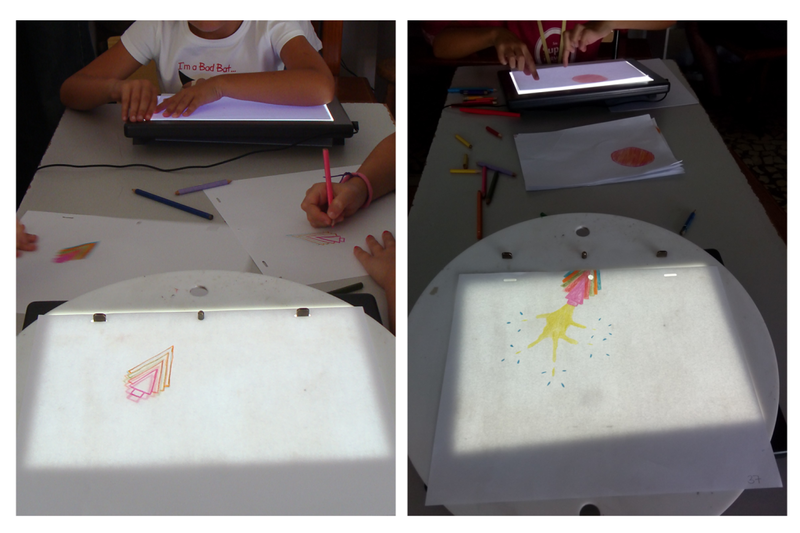 As part of the camp’s public programme he hosted an animation workshop for school students, and a light-box drawing event under the star-filled Abrantes sky. I was lucky to spend two days working and learning from Arthur, creating drawings for the animation and assisting at his children’s workshop. The video he created from the week’s drawings was presented at the camp’s closing ceremony and is now premiering online as part of the Illustrators Illustrated 180 Creative Camp special. The children’s workshop was hosted in one of the most interesting and innovative buildings in Abrantes. Located on the main civic square and newly renovated, the ground floor housed a stylish cafe and small shop that sold vegetables from their community garden. Upstairs was space used for a weekly cinema and smaller multi-functional rooms. We based ourselves in a well-equipped art room on the rooftop, surrounded by a succulent-laden terrace and shaded by a hand-made patchwork awning. The space is also sometimes used for artist residencies and the paint-covered tables and chairs fought for space with a tree growing boldly in the middle of the room. It was a suitably creative space to host the day-long workshop and very peaceful during the next day’s continued drawing and editing process. It was clear as soon as we met the 10-14 year old participants that Arthur was comfortable and practiced working with young people. After he presented some of his videos we headed down to a cobbled side-street to try some stop-motion photography. 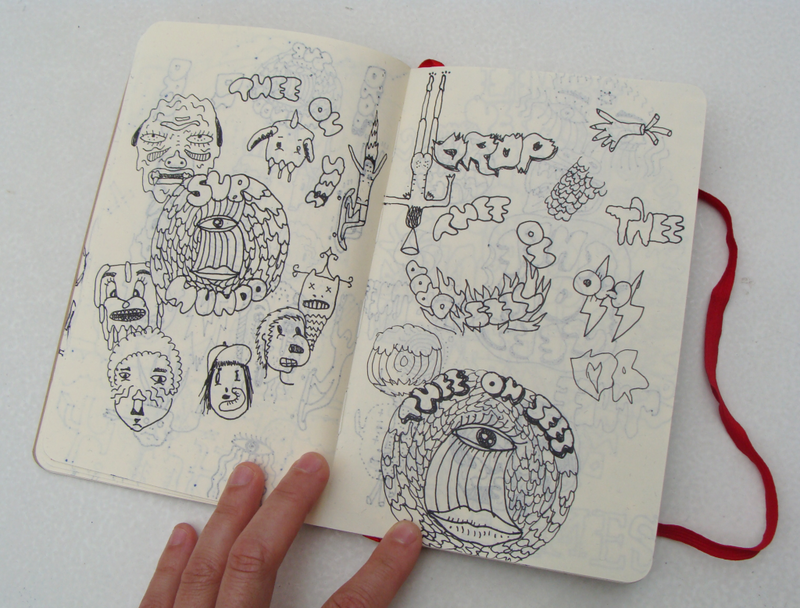 Arthur often uses stop motion, notably in his collaboration with his girlfriend for their clothing brand subnuvem, and also in the cut-out objects, figures and abstract images used in many of his mixed-collage videos. While a photography assistant set up the camera, Arthur explained to the children the ideas and process of stop-motion and asked them to come up with simple routines that we could photograph. The word ‘routine’ threw some girls into fits of delight, doing handstands and dance moves that didn’t quite fit with the ‘simple’ idea. Arthur was very patient in getting them to channel their high energy by focusing them on making small but fun step-by-step movements of their bodies. As the camera assistant took photograph after photograph, the children intently moved through their routines. After lunch we headed back up to the terrace art room where Arthur and João Moreira, a motion designer for Canal 180, started compiling and editing the photographs. Over the course of the afternoon they showed the children the photos and talked to them about the process of putting the photos together as a sequence that would show them moving through the street. Arthur taught some of them how to use a digital pen to draw directly onto their photographs. By being able to see themselves and then draw onto their photos, (one drew himself being slowly eaten by a monster as the stop-motion sequence developed), it was a lovely visual way to spark their imagination while having them participate in the process of animating. The children had previously learnt the basic ideas of frame-by frame animation, so while João continued collating the stop-motion footage, Arthur and I worked with them to create sequences of drawings that grew bigger and smaller or moved across the page. The children were very quick at understanding how to create sequences, although like me tried things that were perhaps a bit complex for an afternoon’s work. He reminded me helpfully that loops and repeating patterns can be a useful way to create content without being so labour intensive, especially when working with children. We drew with simple coloured pencils and pens on white paper. The pages were lit from below by small table-top light-boxes, allowing us to see our previous drawing through the paper. At one point I started using Arthur’s special animation board and paper – a traditional tool for keeping drawings in place. The circular board was made of white perspex that allowed light through and had a ‘peg bar’ along the top. The matching paper had holes to fit it, allowing the sheets of paper to be fixed in place. Compared to my previous drawing sequences, casually laying one sheet of paper on top of the previous one, using the pegs meant that each sheet was perfectly lined up and made it easy to be precise. Using the board made me appreciate the attention to detail needed for animating by hand and I began to suppress my gung-ho attitude as I tried to make a multi-coloured rocket zoom neatly across the paper. As the blazing heat of the day faded, an afternoon’s worth of drawings had piled up on the table. The children and I flipped through the pages and watched their drawings move. Three girls helped me colour in my rocket outlines, and we counted up our final sequence: 72 pages! They were heaved on to the top of the enormous stack of papers. After the last children left, we, unfortunately unable to locate a scanner, began the lengthy process of photographing all of the drawings. 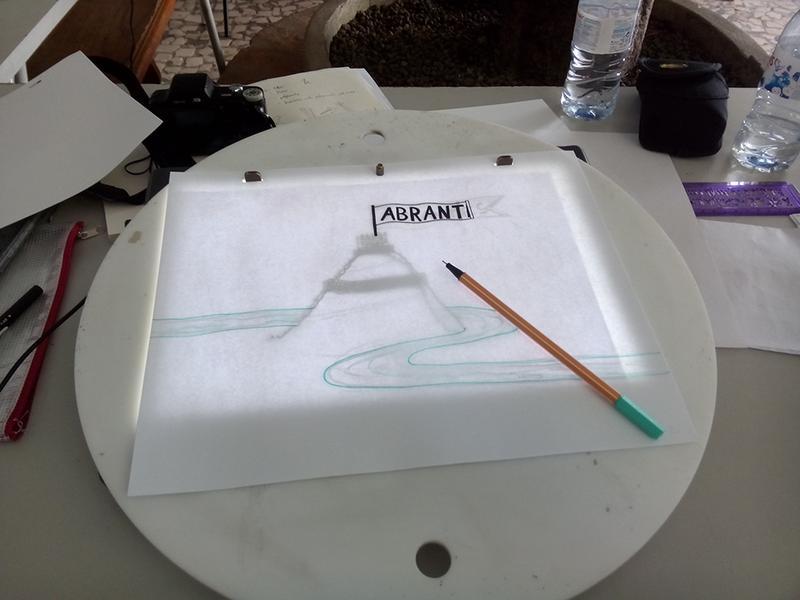 Later in the week Arthur hosted an animation-by-night event in the main square, where participants and the people of the town could use the light boxes to create small sequences, generating more drawings to be added into the final video animation. This time I was feeling more confident, and quickly created a simple sequence of an arm unsuccessfully throwing a paper dart. It was a popular event and you had to fight to get a seat at a light-box. I think it could be a fun event to have regularly for the town. Arthur and João worked for the rest of the week on the computer animation. They edited and looped the children’s colourful, scratchy and strange drawings together to make them appear and disappear, swoop and merge together. Unfortunately I didn’t get the opportunity to learn from Arthur during that time, but with my small amount of experience putting together simple gif animations I know he must have spent hours collating and scanning, editing, and setting the animation to the song chosen by the camp. The roughly finished video was presented at the closing ceremony. My heart leapt as I saw the colourful rocket move quickly across the screen. Depressingly 72 pages doesn’t go far in animation and it is a bit disheartening to see an afternoon’s work shoot by in a couple of seconds. The paper dart, however, looked and moved just as I had imagined. The video has since been re-worked into its present version, now including my unfurling ABRANTES flag. For me the dart and the flag reflect my better understanding of the importance of a strong concept and plan, as well as the precision needed for executing a successful drawing sequence. Working with and talking to Arthur also reinforced to me that it is those small differences between each drawing in a sequence that adds personality, grit and a kind of charm-filled pleasure to an animation. Hand-drawn Animation Workshop · Arthur Carvalho @ 180 Creative Camp Abrantes 2014 from Canal180 on Vimeo. The final animated video featuring drawings by the children and residents of Abrantes and artists and participants of the camp. Thanks Arthur! To see more of Arthur’s work see his submundo Vimeo page and tumblr, or watch some videos below. thee oh sees “drop” from sub mundo on Vimeo. vermes do limbo “d. boon” from sub mundo on Vimeo. vermes do limbo – bêbada – lp adeus igapó from sub mundo on Vimeo.